Thanks to Janine for pointing out this story of a python which burst open after gobbling up a Florida gator. The strange scene was found by park rangers in the Everglades National Park. The Burmese python is likely an escaped pet or perhaps a descendant of one. In recent years many guilt-ridden owners release their exotic pets into the hot and wet swampy environment because they are no longer able to take care of them and do not want them put down. Because pythons are not natural to the environment, the rangers suspect that they challenge the alligators' position as apex predators in the food chain. Frank Mazzotti, a University of Florida wildlife professor, says "Encounters like that are almost never seen in the wild. They were probably evenly matched in size. If the python got a good grip on the alligator before the alligator got a good grip on him, he could win." He also suggested that the alligator may have clawed at the python's stomach, leading it to burst. This is not the first encounter between the two giant reptiles, at least three other similar incidents have been recorded in the past. 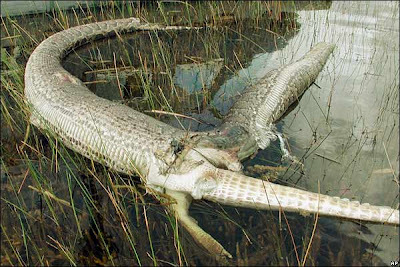 The picture (click to enlarge) depicts a 2m long alligator partially swallowed by 4m long python, whose belly ruptured during the process. The victim's tail and hindlimbs are protruding from the predator’s burst abdomen. The head of the python was missing, perhaps due to scavenging by other wildlife.